Right then, off on a mission, some might say a mission behind enemy lines, I wouldn’t be as cynical as that. 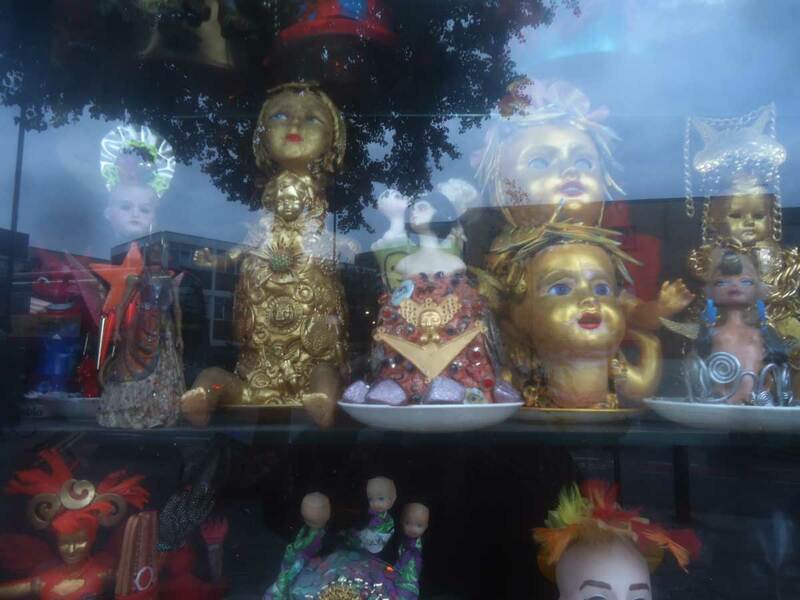 The Frieze Art Fair kicks off today, we’ll be back with more in a bit, meanwhile, over the road in a church questions are being asked…..
For three days only, sixteen of the most dynamic female artists in London are coming together for TAKE! 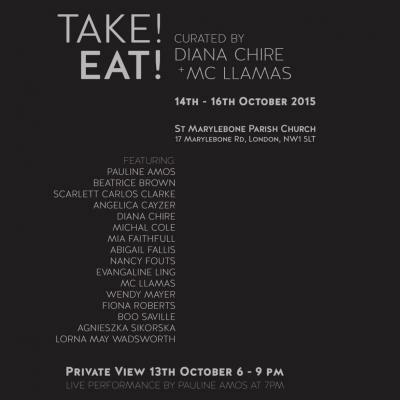 EAT!, an exhibition put together by Artist/Curators Diana Chire & MC Llamas. Situated right on the door step of the monster that is the Frieze Art Fair, St “Marylebone Parish Church will act as the backdrop for TAKE! EAT! which is anticipated to be one of the most notable guerrilla exhibitions of the year”. “After acknowledging the disproportionate amount of male artists championed and exhibited in the art world, Chire & Llamas’ exhibition isn’t a negative rebuttal to the role of the female artist, but a positive showcase of practicing contemporaries who create exciting and vital work. By taking matters in their own hands and creating an arena for women in the contemporary art world, TAKE! EAT! revives the spirit of Damien Hirst’s legendary 1988 exhibition Freeze, creating a new mosaic of renegades, mediums and an audaciously unforgettable show. Exhibiting Artists: Pauline Amos, Beatrice Brown, Scarlett Carlos Clarke, Angelica Cayzer, Diana Chire, Michal Cole, Mia Faithfull, Abigail Fallis, Nancy Fouts, Evangaline Ling, MC Llamas, Wendy Mayer, Fiona Roberts, Boo Saville, Agnieszka Sikorska, & Lorna May Wadsworth. The event starts on Wednesday 14th October and ends on Friday 16th (9am to 5pm) Venue St. Marylebone Parish Church. Address 17 Marylebone Rod, London, NW1 5LT.